I also put a faint portrait of Lincoln in there... I think it adds something to the map. though the text is good. how can people vote for sandstone?! it looks unprofessional! Herakilla wrote: how can people vote for sandstone?! it looks unprofessional! I dunno, tell all your friends. I voted for marble too. 4 to 5. Apparently my vote was the swing vote. As I said, I think I'd like the marble better if it was a bit lighter and didn't obscure as much. Officially consider my vote changed [pending a lightening]. -Maryland, while adjacent to DC, was considered a "border state" (states which were Considered Union but were also "slave states"). Just to keep things someone uncomplicated, the neutral and border states were grouped together under the term "neutral". -Both Delaware and Rhode Island were left out of the map due to size restraints, and I don't think gameplay should be affected by this. -I see what you're saying about the Legend number sizes and rivers being smoothe and jagged. These issues will both be addressed as well as more precise placement of the key cities. I really prefer the marbled texture and will try some different marbeling in future revisions. The effect can be taken off of the flag and opacity adjusted to reduce the "dirty" appearance. It think there may be some give and take on this, as I want the map to look crisp, yet have a feel for the era represented. -Are you suggesting that the color of the states grouped with Pennsylvania should be changed? I personally like the sandstone texture. I think that it almost gives the map the look of being on parchment, makes it more like a literal map. The marble one looks nice too, I'm not sure why there were complaints in the first place, but the sandstone looks even better. yeah, its too bright it don't go with the MA region, try to make the PA region darker and also try to darken the MA area. Maybe try a mix of the two textures to add interest and veriaty rather than just going for one. Okay, the texture poll ended at a deadlock, so I combined the two textures and I'm pleased with this one. -New, larger swords are now positioned directly behind the title. -The ships and bridges have been redrawn and repositioned. -The sea attack lines have been redone. -More margin has been given to the right side of the Legend. Elijah, looking good....two things, the size of text font on ships varies, is that deliberate? Also, did someone ask for the swords to move behind the title....i think they were better underneath IMHO. Which of the two maps below do you prefer. The font sizes were an oversight... corrected for the next revision. Any input on that will be appreciated. cairnswk wrote: Elijah, looking good....two things, the size of text font on ships varies, is that deliberate? Might you want one on "Louisiana" to make it 100% clear that its not two different teritorys? -Maryland has been changed from nuetral to being a Union state. -The swords have been "un"embossed and made to look like swords again. -The ships and bridges have been redrawn and repositioned; An attack line has been drawn from Maryland to USS4; A third bridge has been added to make it clear that Louisiana and Mississippi can attack each other. -The bugle has been made a little smaller. With this revision I've taken all the suggestions that were previously unaddressed and either made changes or decided that the graphics and/or gameplay would not benefit from it. 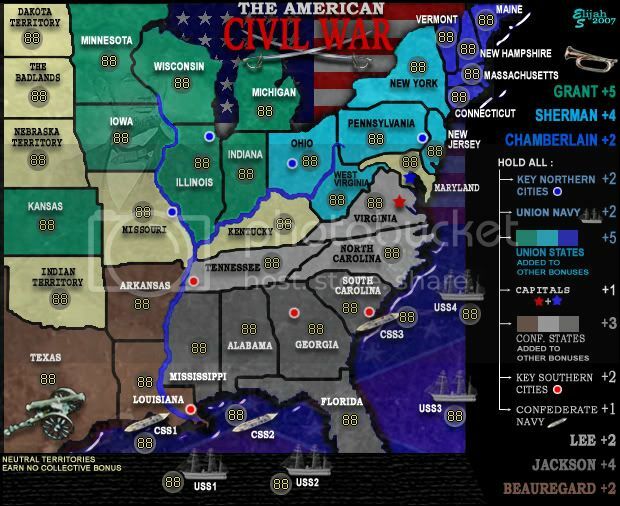 Maryland becoming a Union state seemed to make both geographic and gameplay sense; So, although the argument could be made that it was in fact nuetral, I agreed that the Union capital should fall within the borders of a Union state. The attack line from Maryland to one of the union ships also seemed to be something that would provide a means for the Union fleet to possibly be owned by a northern general, enhancing gameplay. 1. the various images (cannon, trumpet, swords) look like they have a poor quality. very blurry and pixely. 3. the bevel on the ships is too abrupt. 4. the edges of the land look really strange. there seems to be a blue-ish thing o the outside. and they look very jagged. as if someone very poorly cut the land from the sea. 5. the land is casting shadow on the sea but it's casting it in all directions. 1) I like the swords. The cannon and trumpet might look better if they swap places, but I can't be sure. 2) No idea what you are talking about here. 3) It's consistent, I'm sorry you don't like bevel. I think they look good. 4) Very expertly cut the land from the sea you mean? Jagged like it really is? I don't see how this needs to be changed. 5) It's floating above, at least that's the effect it gives me, and I like it. Sort of an abstract realism. 6) How so? Elaborate please. I think most of your complaints are about the abruptness of all the style choices made. Abruptness is kind of a theme here though, and I don't want to see this needlessly smoothed out. what are the yellow territories, i cant figure it out. They are neutral to the conflict. Bottom Left Corner. Maybe giving them a square like the ones on the right have will make this clearer. Coleman wrote: They are neutral to the conflict. Bottom Left Corner. Maybe giving them a square like the ones on the right have will make this clearer. ah, i didnt see that little thing, and the color was brighter than everything else so i thought they were important or something. I've already tuned the yellow states down a notch, but I can bring them down a little more. I'll also play with putting some kind of border around where it states the yellows are nuetrals. I don't see this pixelation issue with the icons, but I'll see if I can tweek that too. I'd move the statement about neutral territories to sit in the rest of the legend on the right, just to avoid confusion. But that's a very small nit to pick in what looks to me to be a almost-ready map - good work. 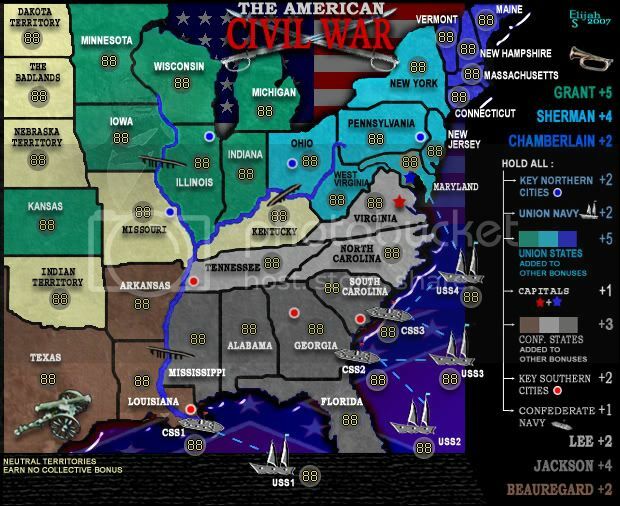 I'll chuck this idea in even though it's ill thought out and probably impossible to implement - In the game 'North and South' for the Amiga 500 (yes, I'm showing my age, shut up), there were two territories - one bordering Mexico and on bordering Canada, where, if you left an army there for too long, it would be attacked by angry Indians or Mexicans who would wipe out you army. It meant that when you won the territory, you had to move people out of it again quickly. I was wondering if the programming would enable you to have a territory that 'drained' one army per round from that territory - perhaps down to a minimum of one. Could create an interesting dynamic. But maybe this isn't the right map for that, as it's clearly pretty well balanced as it stands. -The Neutral States color has been changed to light green, providing a better blend with the overall color scheme and placing less emphasis on them. -A color block has been placed beside the phrase stating that Neutral States earn no collective bonus. -The overall image has been lightened a bit. -The army numbers have been turned off to get ready for Final Forge and the writing of the xml. Once more, thanks to everyone who has provided input on this project. I think the result is an intiguing map that will be fun and challenging to play! It seems to me that the vast majority of opinion here in the foundry comes from other mapmakers, and while we're graphic artists, we're also CC players who enjoy lively gameplay... so hats off to all of you who enjoy the satisfaction of sweeping the board in an escalating cards game! I was originally planning to write the script myself, but with time restraints (my boss wants me to get back to work! Go figure... lol) I'd gladly let someone else do it. There's plenty of room at the top right corner for another name! Any takers?